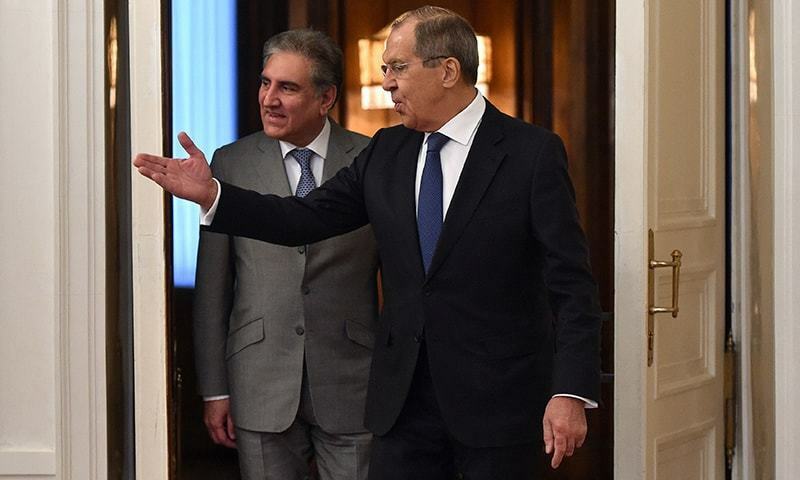 Foreign Minister Shah Mahmood Qureshi on Wednesday held a meeting with his Russian counterpart Sergey Lavrov on his trip to Moscow, his last stop on a whirlwind four-nation tour. The ministers held in-depth talks on various bilateral and regional issues, including recent developments concerning the Afghan peace process. The two sides “agreed to continue efforts, including through Moscow Format of Consultations, for supporting reconciliation under an Afghan-led and Afghan-owned peace process”, a press release issued by the Foreign Office said. The Russain foreign minister “acknowledged” Pakistan’s efforts to achieve a political settlement in Afghanistan and offered his country’s support to bring stability in the region, according to the statement. It was underlined during the meeting that “being the most important stakeholders”, Pakistan and Russia have shared interests and concerns in Afghanistan. They also have a common goal of supporting all efforts to restore peace and stability to the country. The two leaders also discussed bilateral relations between Russia and Pakistan and developments in the regional situation, with Qureshi stating that Islamabad “greatly values” its relations with Moscow. “He also expressed government of Pakistan’s desire to forge a long-term, multidimensional partnership and friendship with Russia,” the FO statement said. Qureshi, who was accompanied at the meeting by Foreign Secretary Tehmina Janjua and senior officials of the foreign ministry, was received by Pakistani Ambassador to Russia Qazi Khalilullah upon his arrival in Moscow earlier today. Both Russia and Pakistan have been actively trying to revive the peace process in war-torn Afghanistan. In order to kickstart direct negotiations between the Afghan Taliban and the Afghan government, Moscow had last month hosted peace talks that were attended by delegations of the Taliban, the Afghan government and global stakeholders. A Pakistani delegation had also attended the peace talks. Last week, Pakistan brokered a meeting between the United States and the Taliban in Abu Dhabi in a bid to pave the way for reviving the peace process that has remained stalled since 2015. The talks were arranged after the US President Donald Trump wrote a letter to Prime Minister Imran Khan seeking Pakistan’s help in mending Afghan peace process. The overture came after a patch of tense ties between the US and Pakistan since President Trump last year announced his Afghanistan and South Asia strategy in which Islamabad was accused of not acting against terrorist safe havens.